???????? ?? ?????????? ?? ???????? ???? ?? ????????????????? ? ???????????? ?? ???? 2008? ????????? ??????????????? ? ??? ?????? ?? ????? ???????????? ?????????? ???????? ?? \?????????? ?? ????????/?????? ?/ ?? ????????????????? ???????????????? ??????? ?? ???? .???? ??? ????????????????? 2009 ?.???????? ?? 01.11.09? ?????????? ???????? ?? ?????????? ?? ???????? /????? ?/ ?? ????????????????? ? ?????????? ??????? ?? ???? ?? ??????? ? ??????????????. 2011? ??????? ? “?????? ????” ? ????????? ???????? ???????????? ?? ????? “????????????? ????????? ?? ????? ??? ????????????????? ?????????? ?” .?? ????? ??? ?? ??????? ?????????? ?? ?????? , ? ?????? : 1.?????????? ?? ??????? ?? ??????????? ??????? ? ???? 2010? ? 2.???????? ? ???????????? ????? ?? ????????? ???????? ??????????? ?? ????????? ???????? ,?? ?????????????? ?? ????????? ???????? ?? ????? ????????? ?? ????????? ????????? .????????????? ?? ???? ??????? ?? ??????????? ??????????? ? ????????? ? ?????????????? , ????? ?? ???? ??????? ???? 2010? -2011? ?? “???????????? ?????????? ?????? ????? ? ??????? ” ?? ???????? ???? ?? ????? ?????? ?? ” ?????????? ????????????? ????? ?? ????????????????? ???????????????? ??????? ?? ??? ?” ??? ?????????? ?? ??????????????? ???????????? ?? ???????? ?? ??????????????? ??????? ?? ????. We are pleased to present briefly the mission and activities of the Health Foundation “Control of the Acquired Immunodeficiencies Associated with Changes in the Environment”. The Foundation was established in 1991.
ine oncologic practice. Currently it only complements them by improving their efficiency and reducing the risk of their side effects. But the future belongs to the biotherapy of cancer. The means for fulfilling the mission is through the creation of a specialized center or institute for immunoprevention and biotherapy of cancer. In 1995 the Foundation organized and held the first in our country scientific conference in immunoprevention and biotherapy of cancer with international attendance, where the focus was on immunodeficiency in malignant tumors. The attendees agreed on the necessity to carry out immunoprevention of immunodeficiencies in the preoperative and post-operative period, and on reducing the risk of relapse and side effects associated with the routine means in tumor therapy. 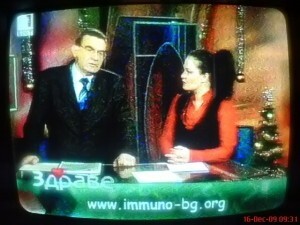 In 2006 we organized by our initiative the second Bulgarian internationally attended conference in biotherapy of cancer. Conference attendees became convinced of the need to establish a center or institute for biotherapy of cancer. There is no such center in our country yet, nor in Southeastern Europe. Conference attendees founded for the first time in Bulgaria a Program Advisory Council for Immunoprevention and Immunotherapy of Cancer. It consists of over 30 highly qualified professionals, most of whom with academic ranks of professors and associate professors, in around 9-10 medico-biological fields and medical specialties. 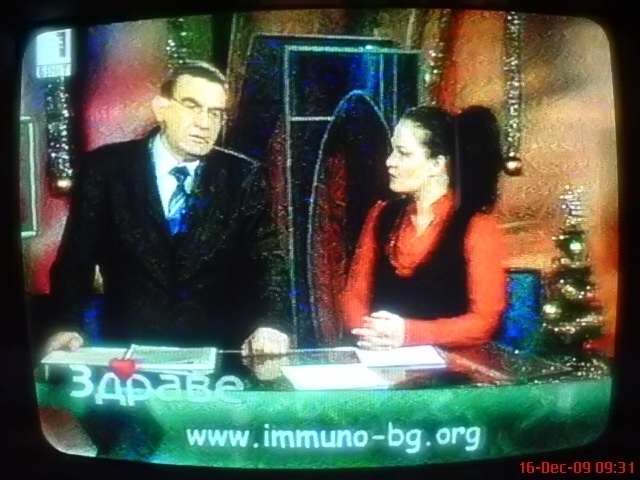 On 01.11.2009 we announced in the domestic electronic media the launch of a National Subscription List for the establishment of an institute or center for immunoprevention and biotherapy of cancer. The decision to seek public support for funding this unique project with funds from the EU is not only dictated by the mission and scope of activity of our Foundation but also by the recent decision of the European Parliament of 29.07.2009. For the first time it requires all EU members to join effort in fighting cancer. Under the regulations and rules of the European Parliament, when 1 000 000 signatures are collected, it is obliged to consider and make the most positive decision possible in support of that request, respectively for funding this project by our initiative. To be able to accelerate the subscription, we need to receive a grant for the production of at least 1 video clip for the Subscription List “1 000 000 friends”. The video clip should be broadcast at least once a month for at least 3 months. Grant proposal: To produce the video clip we need around 5 000 Euro and at least 3 000 Euro for each broadcast, respectively, for three months, 9 000 Euro or a total of about 15 000 Euro. We also need to produce other promotional materials such as cards, pens, posters, t-shirts, etc. worth about 5 000 Euro, or we need a total of 20 000 Euro. We suggest a grant where the bank covers the entire funding for the advertising campaign amounting to 20 000 Euro. The other option is where it covers part of the amount, for example half of the required amount, and the other half we will seek from other donors. The period in which it is good to receive the grant is during the second half of December, possibly before the end of 2009 and even better as earlier as possible before the onset of the Christmas holidays. If a grant is received, the Foundation will mention the name of the bank in each of its public appearances before the media, it will show the name of the bank in the video clip, and it will put the bank’s logo on the Foundation’s website. We propose to hold a joint press conference announcing the cooperation for the establishment of the center/institute for immunoprevention and biotherapy of cancer.